You might hear the saying “Fast is fine, but accuracy is everything”, a quote by Xenophon, a student of Socrates. Drilling machine will do your drilling fast and safe but for getting the accuracy of your tasks, you have to setup it with a drill press table. But, all the drill press tables will not work best for everyone, you have to pick the best drill press table for your grinding and drilling assessing your level of tasks. To help you choose the right dill press table for your work, we researched and prepared a comprehensive review along with a buying guide. We hope this will relieve your tension of how I select the best from the crowd of good and better. Whatever you call this drill press table, a budget table or a good performer for the beginner, it will justify your statement. This is an impressive table, comes at an affordable price. But, the affordability never affects the durability and function of the table. The table is made of durable materials. It works with almost all the drill, and thanks to its sleek white surface that maintain a healthy working ambiance inside of a hard and noisy workshop. The reason behind its vast popularity is, it’s versatile for pros, yet user-friendly for the beginners. Overall, it will offer you more work space with a higher level of correctness and precision. 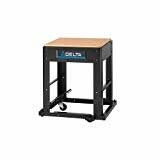 MLCS 9765 drill press table is made of MDF Melamine, has a thickness of 7/8-inch. This structure is capable of delivering utmost support around your entire drilling sessions. You can press down hard, and this will hold definitely. In terms of functionality, this board works with almost any drill machine. The 9-5/7 inch parallel slots on center bolts allow the table to be perfectly compatible with the pressers. In most cases, the table functions well in its default measurement, only in some unique cases it requires small modification. The table has “T-tracks” to hold down the object along with the fence. This bonding enables you to drill heavy objects with full of focus and firmness. Depending on your substances you can position the rails on the table wherever you want. Every time, be sure that you have tightened the tracks before switching on the drill. To make sure that you don’t drill too deep, the table features an Insert. You can change the position of this Insert, it is also completely removable. Because of continuous drilling, once this insert becomes spoiled and you have to get a new one. Dewalt is the most chatted name when it’s about grinding, drilling, and holing. 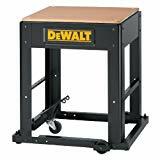 This drilling supporting table is also a symbol of Dewalt’s famousness. If you mostly work on substantial projects, this DW7350 is the best for you. Once you see this Dewalt’s creation, you can realize how much robust it is, credit to its steel foundation. Because of its solid structure, the table can take up a heavy load and high pressure. For most of the tools, less weight is expected, but here you will love the hefty weight of the table. As the table weighs 59 pounds, it remains rock stable at the time of drilling. You never have to carry this monster; it has wheels for moving. A combination of steel and fiber gives this table a solid structure. The lower panel of the table is made of steel materials and the top is made of fiber. The table also comes in the drilled state, so that the users can attach it with any drill presser without sweating. The bottom panel 4-wheels made the bulkiness of this table blessing for it. Wheels make it easy to move the table here to there. Without these wheels, this 59-pound table’s rock-hard structure would be questionable, especially for a busy workshop who frequently changes the working position. Because of its solid body, the stand is very much firm on the ground. At first sight few would be buyers become confused because of bottom wheels, later they got it. Wheels are removable, they can be fixed with the table, or taken away by the help of a foot pedal. So no way to be tensed about the wheels or about the balance. The stand can be prepared for heavy-duty drilling within a very short time. For quick set up, medium-density fiberboard top comes in pre-drilled condition. However, if your drill doesn’t line up with the existing holes, you can make new holes on the board painlessly. Dewalt’s products are durable by nature. Materials like fiberboard and reliable, heavy-gauge steel brackets are used to shape the drill press table. This combination capable of supporting even the bulkiest drillers around the years. It can be said that HTC-HTT-31 is Jack of all trades when you consider compatibility with the variability in drill pressing. The table can be an ideal choice for them who are looking for a verity performer with a standard budget range. It provides many things compared to its price. HTT-31 supporting stand is made of the durable steel frames for long lasting solid service. Imprinted ruler and the addition of extra shelf are two unique features those add extra values to this budget unit. After all, you will get yearlong balanced and quality service from this drill press table. Solid building structure allows the table to bear massive weight. You can lift 500-pound weight materials on the HTC-HIT 1 and neither it will break nor even bend. The sturdy steel made frames keep the table persistent to stand alone under such homogenous weight. Robust steel frames meet the first condition of stability during drilling or grinding. Moreover, the rubber paddings at the end of each frame and convenient distance among the legs do the remaining jobs to ensure a stable skid-free drilling for the operator. This drill press stand not only supports your drill presser machine; it also will help you to do drilling without any hindrance. It has a utility shelf just next to its fiberboard, where you can keep your drilling utilities organized and at your finger strip. This shelf also a good addition for those users who are suffering from tools losing phobia. Measuring is the key to accurate operation. An Imprinted ruler on the fiberboard of the top of the table will make your measuring easy. Now, in between drilling you don’t need to search for a ruler or measuring tape, just keep the tool on the ruler and get your desired size. One of the interesting features of this drill press supporter is the expandability. The top surface of the table is fully expandable. So you will have ample space for handling your apparatuses during operation. The initial size of the panel is 14 x 25 inch and when it is expanded it becomes 20 x 25 inch. Proxxon 27100 is a perfect micro compound drilling stand. It is one of the best tables for drilling, milling, facing and performing grinding operations of small materials. It’s also a solution for the users who have to work in a busy congested workshop. The table is small but loaded with lots of benefits. This model is the most accurate drill press table among all the models of Proxxon. Talking about its features, it has a stable structure, t-tracks, ruler, dust protection, and other working features those are essential to support small substances during operation. Proxxon 27100’s overall qualities are different from a usual drilling support table. It’s a small tool specialist. You will get an impressive result when you drill tiny and sensitive tools, those are prone to break. With this table, you can do a lot of drilling without pressurizing that much. So, you can work more and more, without being tried. Dust is a common enemy for all types of the drill press. Dust destroys sharpness of a spindle and leads the spindle to get broken. But, if you use this Proxxon 27100 table the spindle will be protected from the dust by a safety layer, so dust has no chance to harm the work ability of the drill press. Proxxon 27100 micro compound board is featured with an adjustable ruler. The ruler allows positioning the cross slide perfectly. The adjustable ruler also helps to do the drilling with definite measurement. Having this ruler, even a lazy and amateur user can get the right cut of the tools. At first glance, this table looks marginally complicated, but trust me this not at all. The manufacturer designed necessary parts and screw in the most convenient way so that you can set up the board with a minimal effort, even if you are not experienced in installing. 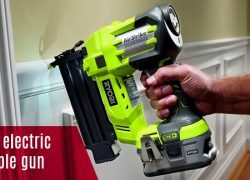 This Proxxon product is lightweight but, it doesn’t mean that it is less strong. This micro table is made of aluminum, that’s why it has sturdy body and capability of delivering long-lasting drilling support. Basically, the aluminum structure made this drill press board lightweight, and users can move it anywhere smoothly without the help of others. 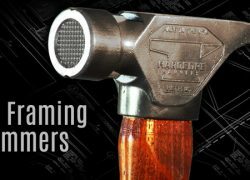 If you are looking for something that will be your woodworking support, this D2056 can a way to get that. To us, this one is the best for woodworking. Besides woodworking, the stand is good for bench-top tools like chop saws, planers, drill presses, band saws, and scroll saws. The most mesmerizing fact about this stand is its ability to hold 700 pounds of weight! Which is really a persuasive factor to choose this table. Starting from build quality to being balanced while drilling and helping the operator doing quality work, the drill press table is something that a woodworker couldn’t ignore. The table has durable build quality. Its surface is supported with cross braces which makes the table stronger than other without cross brace tables. As a result, the table can bear the mammoth amount of weight which is adequate for working. Additionally, butcher block finish of the board prevents slipping up and causing an accident. The stand is designed to give you a solid stable work area. Due to its overall structure, construction, and rubber paddings at its legs, the table remains even all over the working hour. Even if the floor surface is uneven it will assure a firm grip for your smooth operation. 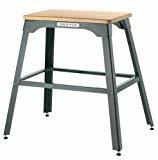 If you are fearful of losing tool or have to stop drilling frequently for taking small things in between drilling, this extra space of this table can be your way of a solution. Just underneath the top surface, there are four frames with the legs. You can create a storage zone for keeping all the necessary components organized for an unstoppable drilling session. The robust materials and design will make sure that you will get the same secured service from your drill press table around the seasons. 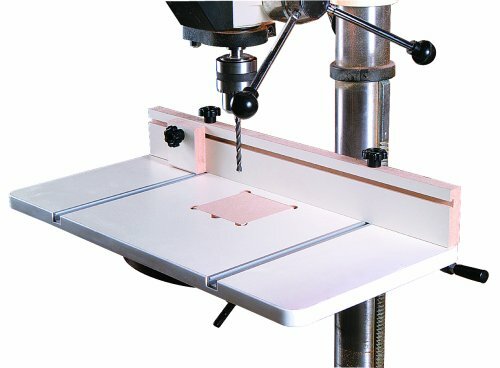 If you are looking for a drill press table that is a combination of sweet price and all the perks of a top-end drill press stand, you can try MLCS-2326. The table gets you all the necessary features without shedding much of a skin from your wallet. You will have a surface area measures 12-inch by 24-inch to work on, this is a moderate space for a drill presser. The surface area is made of MDF melamine, which is robust and refined enough to ensure solid operation with smooth movement of the materials. T-Tracks holds down the tools along the fence of the table. As a result, you can drill heavy objects on it without any problem. You can also position the rails wherever you want on the table. This T-Tracks also features measurement scales. Using the scale, you can be sure that you are drilling things accurately. To ensure the proper deepness of drilling materials there is an Insert. You can change the position of the insert depending on your tools requirement. It is also completely removable. After a few drilling sessions,you have to change this Insert. 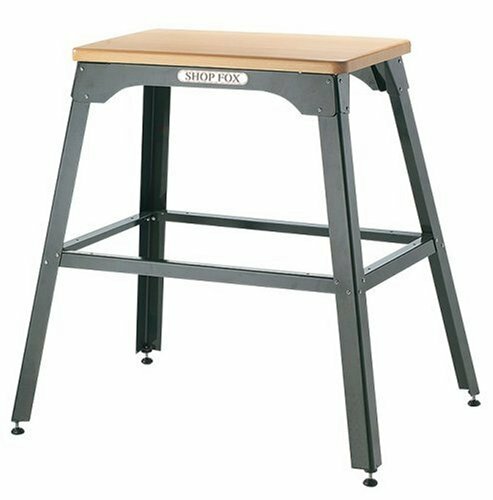 This flat drill press table features an adjustable fence that delivers you with a maximum holding power. According to your requirements, you can adjust the size of the fence. Having this fence, you can handle your drilling effectually while still getting the desirable solidity. The table is lightweight. So, for workshop who tends to drill here and there, they can be benefited by this lightness of the drill supporting table. 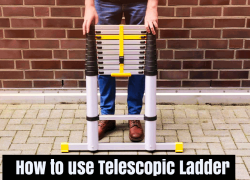 If space is not your problem, then you should consider this one. The MLCS is one the best table for drill press with large wide and length. The few extra inches of the table can make a huge difference in your work if you are used to operating large pieces of items on the table such as doors. The table includes an improved version of fence design that facilitates in additional handle clearance without necessarily moving the fence. Also features other essential qualities like a sand drum and sufficient space for designing. After all, using this table, you can enhance versatility and precision of your large bench top and floor standing drill pressers. MLCS 9778 is made of durable melamine which will keep the table exterior protected even in most humid environments. Because of its manufactured materials, it is a heavy one compared to the other drill press tables. But this extra weight also takes care of the constancy and balance. With the improved fence design, the table solved the problem of the fence interfering with the drill handle. As a solution, the table attaches cutout on the one side of the fence. Now you can customize the drill handle without pulling the fence away first. T-tracks works both for steadiness and accuracy. Here tracks are included but note that the holds down must be purchased separately. 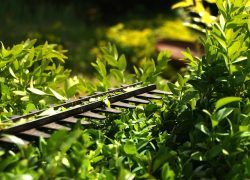 However, the tracks are changeable depending on the size and shape of the objects. MLCS 9778 has a simple design without any additional frills. Design of the table especially facilitates the users making various crafts and artwork on the wood. As crafting needs more exactness than normal works, a table with full of free space only able to provide such space. 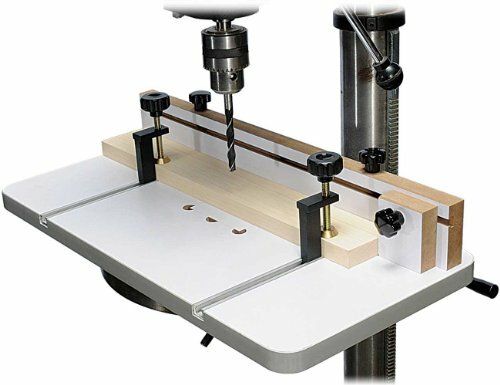 Woodstock D4033 is one of the best budget drill press tables. If you are carving for quality and accuracy without hurting your wallet much this can be an option for you. It's an excellent table with lots of useful features. The table offers plenty of free space with a measurement of 24 inches long and 12 inches wide. Here in this product, Woodstock cares both performance and durability. Manufacturer facilitates t-track, adjustable fence for efficient performance, and used medium density coated fiberboard for cleanliness and sturdiness. The board is made of simple wood but covered with a melamine layer. This combo empowers the table to tackle pressured drilling as well as from the rough environment. Here is an expert advice for you, if you want to make your fence last longer, you can seal exposed wood on the table, this sealing prevents moisture or other types of damages. This is one of the lighter models of Woodstock as well as in our list. The two universal table clamps enable you to use this unit almost anywhere. In addition, the board can easily be carried between rooms. 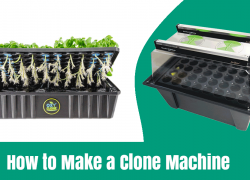 If you have more than one machine, you can use this one with all of them. Table set contains a stop block. This block is a prime solution to increase accurateness and improve the overall quality of drilling. Stop block together with fence and t-track offer the user a secure quick setup of the board. Don’t be tensed seeing the table’s haphazard condition in the pre-installation stage, it’s super easy to install. Woodstock provides a setup system that’s is easy and simple to handle. 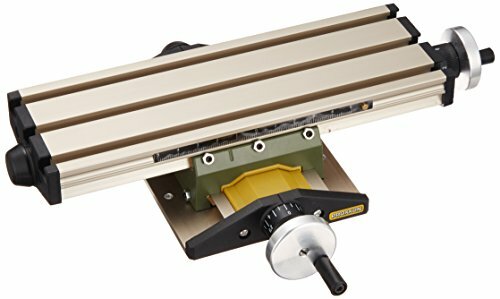 Using underneath clamps you can set up the table with a wide range of drill pressers. Powertec a USA based equipment manufacturer known for producing strength and quality products, this UT1002 is a proud member of their dynasty. 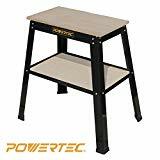 If you are searching for the best table for drilling for your vast array of smaller, compact bench-top machines, power tools, and accessories, UT1002 universal tool stand can be your result. Designed with a stout steel base and MDF top panel. 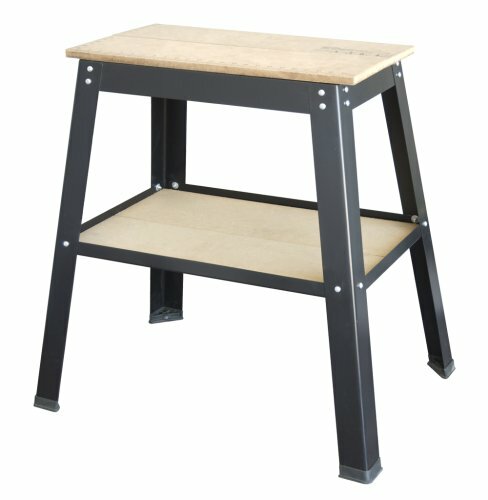 This stand has a load capacity of 500 pounds and a convenient storage shelf below the MDF panel. Features adjustable non-skid foot pads for keeping this entire steel base firm during the operation both on even and uneven ground. Personally, we like this steel base as they are durable, and their extra weight helps the stand to remain balanced on the floor. Powertec also used steel base for this drill press stand, all the legs and horizontal panels are made of steel bar. Along with this, to maintain overall sturdiness, they also used MDF melamine as construction materials of upper surface area. Expandability justifies the universal status of this stand. Having this, users can use this table for a wide range of drilling actions. The MDF surface sheet expands to 14-inch by 25-inch to accommodate large and extra-large tools. In general, sturdy design is enough to keep a stand stable on a smooth surface but for a clumsy ground, this is not enough. To make this stand stable even on bumpy ground producers adjusted pairs of adjustable rubber pads to the bottom of the legs. Some drill stand just includes frames for secondary shelf here you will get the entire shelf that is made with an extra wooden area. This extra space helps to keep the drilling accessories just at your hand. The secondary shelf is removable if you think it will hinder your drilling you can remove it. Accuracy comes from accurate measurements. To ensure accurateness of your drilling task Powertec printed two rulers on two sides of the top surface panel. Two ruler exhibits two different quantities, one on the vertical and another on the horizontal side. Delta 22-593 deserves a place whoever made the list of drill press table. It’s an ideal choice for them who care much about quality and precision even from the vast drilling tasks. And of course, who wants to spend a handsome amount of cash to get his/her desired drill support. The stand looks and feels so solid that anyone sees this the anticipation of getting great drilling experience goes high to higher. The overall building arrangement is able to provide you with top-notch service with your expected accuracy and excellence. This stand is moveable and suits with most of drilling presser prototypes. Building quality is the key features of this table and the heavy-duty steel frames are the reasons behind this. The frames are wide and solid than other drill stands, which adds more power to the table. Hefty frames are also equally spaced in a square size, as a result, the stand makes minimal vibration during operation. Other than four vertical legs there are six more horizontal arms included with the table. A drill press stands that costs a handsome amount should have the opportunity of various usages. Here wheels create the opportunity for the users to use this table with various models and places of your workshop. Using this wheels, you can move the table wherever you want. It basically, one for all drill machines of your workshop. The stand comes with Pre-Drilled holes those match the bases of Delta planer models 22-590 and TP305. So if you use this stand with those two planers you will get the quickest mounting. You have to just unpack, mount, and start using. Other than those models the stand also accepts most of the bench top planers. Attaching a quick foot action lock and release pedal the manufacturer provides more control on the stand to its users. Using these two you can regulate the speed and movement of the table while moving it from one corner of the workshop to another corner, or from one drill to another. You want to get the drill press table for your workspace and we also want to get you the right one that will meet your needs out and out. There are some users who spent bucks still don’t get expected service from their drill press table. The common reason is they do not know what make a drill press table best, and which drill table is made for them. Even sometimes they find their purchased tables do not fit with their drill pressers! 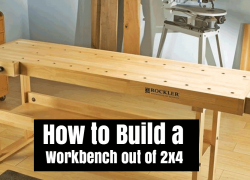 To avoid all uncertainty about buying the right table we will take you a roller-coaster ride of ‘how to buy a perfect drill press table’ through this step by step guide. At the end of the ride, hopefully, you will get one for yourself. 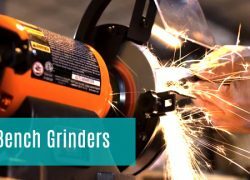 As you want to spend your dollars for the right table, you have to know well about the functional and safety features to look from a drill press table. The inspiration behind purchasing table is getting sufficient free workspace. Some drills come with a table but they are not up to mark for doing regular operations. The average suitable size of a table measures 20-inch x 10-inch work area. However, the size of the table depends on the nature of the work users do. For example, small home operations require small to medium size table, and woodworking, drilling large size metal, designing doors require large size. Durability is the result of awesome building quality. A durable table enables its user to do any kind drilling around the years. Drill press tables are made of wood, MDF melamine, and metal. Almost all the table has a laminated surface. This lamination gives the stand a glittering look also prevents from rough climate. Table are two types some are attachable, and some are separate. Attachable tables weigh less and specially design for attaching with certain models. Separate tables are basically made of metal frame and wooden surface. 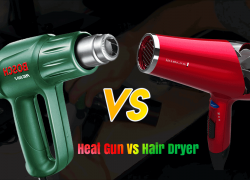 Users who want to use one tool for all drilling and grinding choose this one. Buying a table for setting with the drill requires model number of the drill presser. All the tables are manufactured to be super strong and balanced during operation. For an attachable table stability depends on the setup of the table with drill pressers, and for separate tables stability depends on the weight and bottom panel structure of the table. Weight doesn’t matter of conscious for an attachable table they habitually weigh light. Separate tables are weighed much. Heavyweight is also plus point for them it makes them sturdy. If you tend to move your table too much prefer the lighter table or heavier one with wheels on the bottom. Insert is the adjustable circular or square central point of the board. The portion is removable because here the drill slightly goes down penetrating the object. You have to change this portion of the table occasionally. Insert helps a user to concentrate on drilling rather being conscious of table damaging. Clamps are provided with attachable table only. Using these clamps, you can adjust the table with your drill presser. Different drilling machine requires different clamps for resilient setup. T- tracks are more popular than t-slots. These tracks run through the length of the table and help the user to firmly hold the objects those need to drill. Whether your table has tracks or slots make sure that drilling objects slide smoothly, so that you can enjoy a good workflow with no frustrations or obstructions. Along with those mentioned factors there also utility options of a drill press stand, such as printed ruler for measuring, bottom wheels for moving, secondary shelf for storing, expandable surface for more space, etc. At this point, I hope you already gather some knowledge about the essential and additional factors of a drill press table. Remember that even the best drill press stand doesn’t have all of these benefits, because every table is made with a specific plan, for a specific group of users. So, when you pick a table for yourself it shouldn’t mandatory that the table must have all the benefits. The very first step of buying anything is deciding. 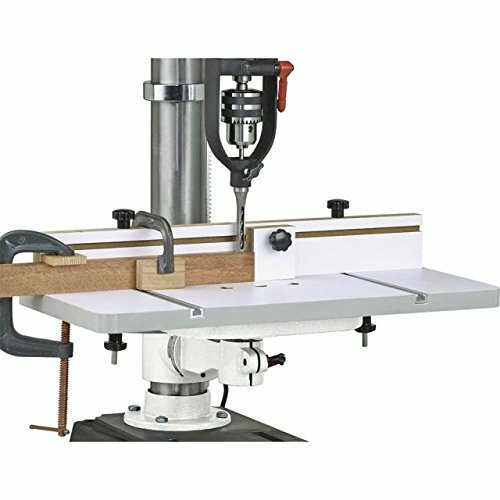 Decide what types of work you will do using your drill press table, and where you will use this. For your assistance below we listed some common supporting tables basing on individuals’ needs. Drill press table for DIY. Drill press table for woodworking. Drill press table for metal. And, drill press table for doing simple household work. After deciding what you will do with your table, you can choose the right table. You can either choose an attachable or separate table. If you go for the attachable table don’t forget to remember your drill presser accepted models of boards, otherwise, boards will not fit with the pressers. Yes, now you can purchase your chosen table. For getting tension-free service, you should check the warranty policies just before buying. As a drill press table reviewer, we always encourage our readers/would be buyers to know your product better before making the purchase decision. Questioning and answering is a popular process of getting clearer idea about anything. Considering that, here we enlisted 10 most frequently asked questions related to drill press tables and answered them. I am confident that these questions and answers will add some additional information to your knowledge about the above reviewed 10 drill press table. And, who knows, you may get the answer of the question that has popped up when you were reading the reviews. Let’s jump in! 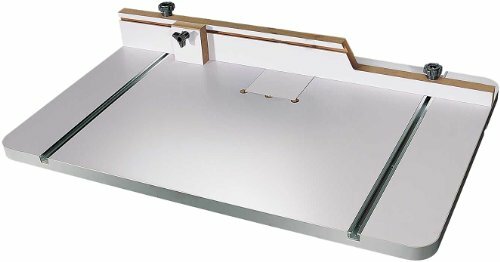 Question-1: What Is The Best Way To Install Drill Press Table? Ans. Hopefully, you will have all the necessary screws and holes provided by the manufacturer. For easy installation, follow instructions manual provided with the table. Always make sure that your Insert is at an exact, square angle to prevent any inaccuracies when you drill. Question 2: How Drill Press Table Attached With The Drill Presser? Ans. A drill press table is attached to a drill presser’s existing framework. For the attached table formation, you just have to buy the board considering drill pressers’ framework’s shape and size. Different drill presses have different mounting options, some are attached with clamps, some with screws. There is also a separate table which doesn’t need any screws or clamps, it comes ready to use state. Question-3: How I Get A Well-Matched Table For My Drill Presser? Ans. Normally, going through the product descriptions you will get to know which model tables are right for your drill presser. Otherwise, you can read reviews or contact the manufacturer to be sure about that. Question-4: What Are The Exact Measurements Of The "Footprint" Of DEWALT DW7350? Ans. Actual footprint measures 25" x 36-1/2". You can mount the wheels both in inside and outside of the stand. Moreover, the measurement varies a little bit from outside mounting to inside mounting. Question-5: Can Proxxon 27100 Table Mill Metal? Ans. Yes, you can mill metals with the Proxxon drill press table. But remember that this is a compound table, not the mill. You will need a set of clamps to go with it. Before milling, remember that drill press isn’t made to take many lateral pressures. 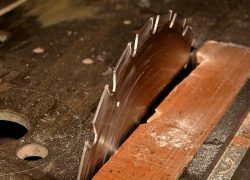 But still, you can make knives, milling wooden handles with this. Remember, to get long drilling experience never put very much lateral pressure on your drill press table. Question-6: Does MLCS 2326 Fit A 10-Inch Drill Press? Ans. Yes, it will mount to virtually any drill presser. But, when you need to move the table the base vacillates and hit the crank, and you'll have to move it forward. Question-7: What Are The Size Of Woodstock D4033 T-Slots? Ans. The T slots are the same as normal slots 3/4 wide and 3/8 deep. Question-8: Could I Attach A Vise Or Bench Grinder To This POWERTEC UT1002? Ans. Yes, you can do that easily. 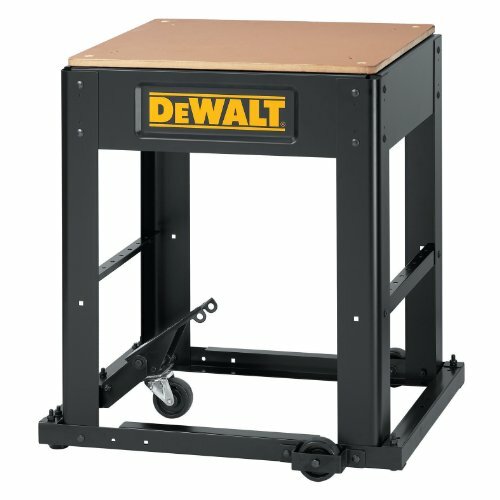 Question-9: Is The Shelf Included With DEWALT DW7350? Ans. Yes, the manufacturer includes the shelf with it. 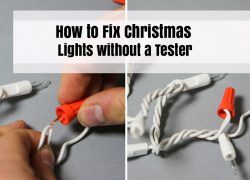 You have to attach it to the frames using the screws. Question-10: Is Proxxon27100 A Drill Presser Or Mini Milling Machine? Ans. The Proxxon27100 neither a drill presser nor a milling machine. It is a precision positioner for a small drill presser. A milling machine already has these precision adjustments. 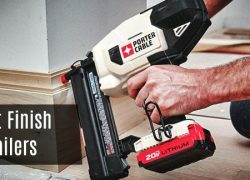 We know, like an amateur user, you could have done you drilling and grinding jobs on random surfaces, but as you care about precision and accuracy you are looking for a special piece of surface and ready for spending some extra bucks on it. We have written this long review and guideline content on drill press table so that you can spend your bucks wisely(and most importantly on the perfect one). We hope now you are able to choose the best drill press table for your workshop and get your desired precision all the time. Please let us know which one you pick and how is your experience with that. We would love to hear from you. Also, any suggestion or recommendation would be appreciated.